The Place I work in the Marina Bay Financial Centre vicinity and it was my third visit to LeVeL33. Located at MBFC tower 1 where Standard Chartered Bank is, I am surprised that the restaurant has been around for eight years. No prizes for guessing which floor it is located, the modern European restaurant has undergone a revamp of its menu recently along with its new Executive Chef ArChan Chan. Food aside, the setting is split into the main indoor contemporary dining area and a sheltered terrace section, which gives a pretty awesome view of Singapore’s skyline. Needless to say, it’s one of the best spots to catch the fireworks during special occasions! Another trivial fact which I only found out on my last visit is that LeVeL33 is also the world’s highest urban microbrewery. The Food As a restaurant which specialises in beer making, I’m not a big drinker of beer but some of the classic offerings here include the Blond Lager, English-style India Pale Ale, Bavarian-style Wheat Beer and Stout, inspired by Irish dry stouts. The menu is a huge revamp from its previous with a focus on Modern European cuisine. One observation of difference for me is that there is a heightened focus on plating this time, which doesn’t render the restaurant as one of those typical restaurant and bar. Even if you don’t drink much beer like me, the beer elements run strong in the dishes. Take the complimentary bread for a start, where the Sourdough bread is made with beer malt and served with yeast beer butter. For something light, the chilled Tomato Consommé (S$22) is great to start the meal. It sounds extravagant for a tomato soup, though the emphasis here is the heirloom and vine-ripened cherry tomatoes. Other ingredients to justify the price include the accompanying olive oil caviar and nasturtium. Some starters which I enjoyed are the Kingfish Sashimi (S$26) and Hokkaido Scallop (S$24). Interestingly, there are also some Japanese elements reflected on the dishes and I’m naturally bias towards them. The Kingfish sashimi here is cured with Blond Lager, served on a bed of nori grain sand. The flavour of the sashimi is fresh and served with unique side ingredients like marinated tapioca sago, tapioca sago chips, cucumber juice and seaweed oil. 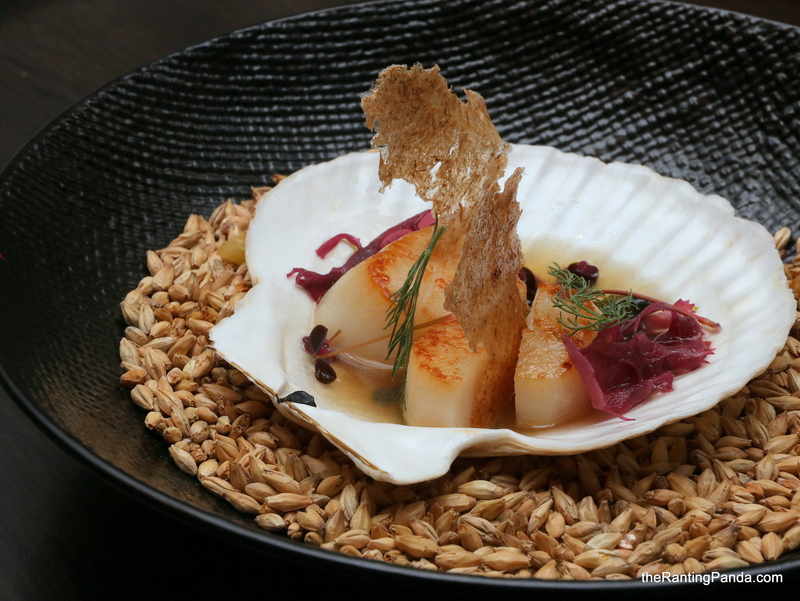 The Hokkaido Scallop (S$24) is also quite straightforward in terms of flavour, though I must highlight the use of wheat beer dashi here which really elevates the taste of the scallop. For mains, the Seabass (S$36) works well for me. I like the crispy texture of the pan-seared local sea bass, where the texture and flavour of the fish is contrasted well with the beer malt risotto served along with it. The risotto here is not quite the traditional Italian flavour due to the beer malt component, though you still get the creamy and cheesy taste from the Parmesan cheese. The other mains which I enjoyed surprisingly is the Garden Greens Tart (S$29), a Gluten-free taro tart ring filled with vegetables. The crispy tart is topped with shaved macadamia nuts and vegetables and as much as it sounds healthy, I find it quite savoury nonetheless. For meats, the Quail (S$27) is marinated with its house-brewed Stout. I usually find quail meat quite gamy but this version is not at all so. The quail is quite tender, served along with grapes, sour carrots and garlic chive flowers. For a safer option, you can’t go wrong with the Truffle Ravioli (S$32). The pasta is creamy and cheesy with the Gruyère cheese, with a nice balance of truffle aroma and crunchy walnut. My least favourite dish is the Pork Intercostal (S$37). It is not a part of pork I’m using to having, the intercostals are the muscles between ribs used to support breathing. Despite the pork being marinated with the housemade IPA and other spices, I found the flavours lacking overall. Pork aside, it is topped with locally sourced clams. For desserts, the Layered Honey Cake (S$15) is a Russian recipe where the cake is served with house made sour cream ice- cream, lemon balm and house- made fermented kumquat. The beer aerated honeycomb is quite unique in flavour, and the sour cream ice-cream has quite a memorable taste, in a good way. Alternatively, the Malt & Stout Parfait (S$12) should suffice the chocoholics. Rants Similar to The Spot, I feel that there is a stronger perception by most people of visiting LeVeL33 for its drinks rather than the food. This is quite challenging to change, especially given that one of the tagline is world’s highest urban microbrewery. Should we be here for the food or drinks? Will I Return Again? The location of the restaurant is prime, and the culinary direction is a good transformation from previous. It’s not so much a romantic date night location, but it will be much fun with friends or colleagues post work to let your hair down, over some beers of course. Make your reservation instantly at LeVeL33 here.